Mr. Celestin is a native of Baton Rouge. He graduated in 2010 from Southeastern Louisiana University with a Bachelor of Arts in History. He received his Juris Doctor degree in 2016 from Southern University Law Center in Baton Rouge. While in law school, Mr. Celestin received the Law Center’s Elaine Simmons Scholarship for Legal Analysis and Writing II. 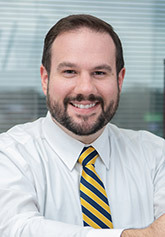 He began his legal career in 2016 at the Louisiana Department of Justice as an Assistant Attorney General, representing the State of Louisiana in various civil litigation matters. Mr. Celestin is a member of the Louisiana State Bar Association, the Baton Rouge Bar Association and is admitted to practice in the U. S. District Court for the Middle District of Louisiana and the U. S. Fifth Circuit Court of Appeals. Mr. Celestin is also an active member of the Knights of Columbus Council #2807, currently serving as its Treasurer. He is in the Baton Rouge office where his practice includes civil litigation defense, employment law and insurance defense.